I've been trying, once again, after all these years I've spent studying and observing, to put together a collection of work. Over the years, I have never sold any of them. I gave them as gifts (which I like to do) and even had two portfolio's stolen(which takes me years to start again). I've noticed there are many different support systems in place now-a-days, for the starting artist as well as the established. Tons of good forums with info! One of the things I've learned recently is what an ACEO is. I had no clue that when I used to fill my friends wallets with my art, that is what those little pics were! An artist here on blogger has some on eBay and was not selfish with the info on what they were. For that I thank her. If you would like to show off your work, talk about your art, or ask any questions, please comment to this post leaving a link to your site if you like. Within your comment leave a tip or useful hint for us --a short paragraph like this one is fine. Be sure to sign it with the name you want (posted by). I will then copy and paste your comment as a post on this blog--include your link and what name you provided and delete the comment. Then others can comment and so on. Or just simply leave a link to your favorite informative group,forum,blog or site. If it is informative I'll gladly include it. Earth day (April 22nd) and I think it is one of many good projects in honor of that day. It supports recycling. It's inexpensive and easy. Remember you don't have to make piñata you can paint it and make vases, bowls, pencil holders, centerpieces, amongst many things. The thicker you make it the stronger it is; and the longer it takes to dry. You don't need to start with balloons either. Cardboard or any paper product is great. You can even make your own picture frames with it. I use flour, water, and Glue-all in mine. I mix it until its pretty thick. It varies. The fun part is to make it so smooth everyone thinks its clay-porcelain or glass! Any good unique recycling ideas? Please share! Please pardon my absence as I have been struggling with a tooth ache from a dark, dreary place. I have even searched for alternative relief on the internet. It is one of those tooth aches that does not involve the gums nor an actual tooth. It's the kind that effects; the root, behind the eye, inside the ear and quite frankly, makes you want to drive your head into a brick wall to get your mind off the real pain. A little toothache makes you sensitive to cold. A severe tooth ache makes you require cold and only be sensitive to the ice melting too fast. I have found that ibuprofen, when taken in excess, makes ya feel rather "blurpy". The main thing for me was to find some form of break from the pain. Something that would let me sleep with out waking up 10 minutes after I dozed off in extreme pain. Dr Tichenor's Antiseptic does just that. One has to dilute this peppermint mouthwash as it is strong as can be. It works great as it burns your mouth beyond belief, while making you drool like a St Bernard over ones shoulder. It's after this point (like 2 minutes) that you can feel it numb and travel to the infected area. Then you can slip off into an ibuprofen induced sleep. Walmart sells Dr Tichenor's and it's usually on the top shelf in a clear bottle with a red white blue and green label. Clove oil works but not quickly, as with salt water, lemon, pepper, and ice. A oral surgeon with a script for antibiotics would work much better I'm sure. But of course, even if you can get to one, you still need some relief in order to make the journey! Feel free to share any tips! Here is a site worth sharing for mothers: Vocalpoint. You may have already heard of it. It's where a mom's voice can be heard on new products, shows, and other things that effect our children. You get savings and free things as a member. I first found out about it through my daughter's school. Either click on the link or be sure to go to (dot com) and not net or anything. Trust me--I punched in the wrong thing once and got the surprise of my life!! lol. 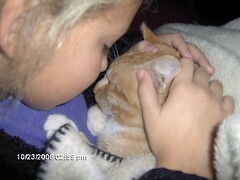 We love our pets and it's hard to say goodbye especially for a child. With our cat, Sunny, he insisted on going outside although he appeared injured, thing is--he never came back. We suspect he may have gone to a special place to lay down--forever. We miss him so much, but we also know it's better that he wasn't suffering. The main thing is to help your child by talking about the loss and listening to their own ideas and understanding of death. It's important not to dismiss their feelings while grieving or to belittle their pain by careless statements. This can be used as a learning oppurtunity and a chance to connect as a family. Don't be afraid to let you child know you are feeling sad as well. Remember that anger can also be part of grieving. The Aspca has a lot of good tips on pet care. You can even get tips on your mobile phone.